Deeply concentrated aromas of cherry and pomegranate lead to darker notes of black pepper and cassis. Star anise, thyme, and rosehip lend a complex aromatic edge. The fresh, bright fruit entry is taut with a lovely coastal purity. 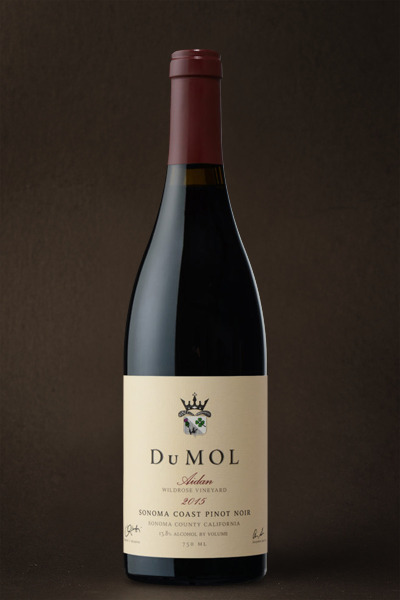 The mid-palate with its sleek dark fruits — black raspberry and blackcurrant — becomes plush and layered with liqueur-like texture underpinned by red apple skin tannins and vibrant acidity culminating in a long, rising flavor-packed finish. Our new release of Wildrose Vineyard is perfectly reflective of this small wonderful vineyard we planted way back in 2000. As befits this unique vintage, the wine is tightly-coiled initially, focused and youthfully vibrant. It steadily deepens and darkens as it relaxes in the glass to reveal a silky mid-palate overrunning with deeply-pitched lilting flavor — all highly seductive. Wildrose’s mature deep-rooted vines provide great depth and concentration; this is a sophisticated wine that challenges your senses from start to finish. A vein of black pepper and Asian spice resonates along the entire arc of the palate and the wine’s structure is lively and mouthwatering. Classic DuMOL weight, power, depth, and intensity is on full display. Don’t hesitate to decant this for an hour before serving to allow the wine's full texture to develop. Expect strong aging potential of ten to twelve years.